I Went To This Restaurant With My Wife On Saturday Night And Had a Wonderful Evening. The Food Was A Delight (Seafood Spaghtetti Out Of This World) And The Service Impeccable - Would Recommend To Everyone. I recently visited this extremely terrible restaurant with my family, which served us rotten prawns in risotto rice. What is even worse is their service �C the waiter kept denying the stinky smell from the prawns which anyone can smell a mile away!!! A complete disgrace to Italian food and Italian �C if you still have feeling for Italian food, then DO NOT spoil it by going to this awful restaurant! Great value quality meals at a reasonable price. The service is great. The only thing I thought was poor was the frozen factory made deserts. The homemade tirramassu was expensive @ �4.55. Overall good value, good food and a nice atmosphere. I would recommend anyone to come and enjoy a real Italian experience in the heart of London. 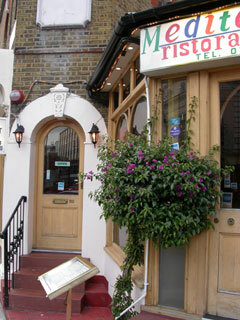 A friendly and cosy restaurant offering a wide range of Italian food. The Menu is comprehensive and great pride is taken in both the cooking and presentation of your food. This restaurant has already established an enviable reputation. It�s situated in a place where there is a near-by hotel and train station. The food is always served with a smile and it makes you feel so welcomed. The best veal in London and a thoroughly enjoyable night! The starters and wine were slightly over priced but let's face it, that is what you come to expect when dining in London and especially in Notting Hill. The quality of food is good and served with a smile (v. important) - would definitely go again. Upon entry you instantly feel the warmth and welcome of the place, with great customer service. I highly recommend it to any one!